Could you be saving money, instead of spending it? Owning a multi-unit complex, resort, RV park, private, or corporate business in Arizona with a master gas meter comes with it a myriad of challenges. As the owner, having a gas master meter means you are considered a gas supplier, and with that comes legal regulations. To be in compliance with the Arizona Corporation Commission (ACC) regulations you must have surveying conducted at your property and have the proper documentation to support its findings on site at all times. 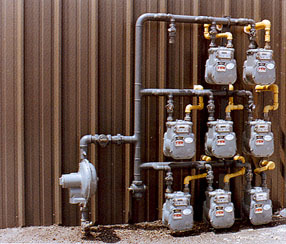 Installing a new gas system, with individual gas meters can save a lot of headaches…and money! The biggest cost saving when you install individual gas meters comes from the elimination of the ACC from governing your gas pipeline system, removing the maintenance requirements, documentation requirements, and the liability of an ACC governed gas system. With individual gas meters comes more efficient building management. Operating costs tend to be lower as gas master meters are old and need regular maintenance and annual inspections so by having individual gas meters you will maximize margins on rental return rates with fewer repairs and attention need for your gas system. The value of the building increases as purchasers want to see newer, individual gas meters so that they don’t have to deal with the ACC regulations themselves. Less downtime when the master gas meter fails and needs repairing. If it fails in the winter, and the property is without proper heating, you could be responsible for finding alternative housing for the residents until the gas is back on. Individual gas meters decrease the possibility of future leaks. This is not just a cost savings, but it also reduces the liability on the property owners. With an individual gas meter, residents of the property are responsible only for the gas they use. Great for people who don’t want to subsidize their neighbors’ gas use! With individual gas meters, residents become more aware of their gas usage, and work harder to conserve gas, which can reduce their overall consumption dramatically. In fact, separate metering has more impact on energy savings (21% savings) than almost any other factor. RP Gas is an Arizona statewide natural gas pipeline contractor. As well as a leading expert in repairs and maintenance of your current master gas meters, we also specialize in the conversions of a master meter to individual metering on your property in Arizona to eliminate the Arizona Corporation Commission from governing your gas system. Contact us if you would like more information on converting your current master meter gas system to individual gas meters in Arizona or if you would like to schedule your Arizona Corporation Commission Pipeline inspection today.